I don’t consider myself the romantic type. I find most classic examples of romance (in the real world) to be, well, embarrassing. I’m much more comfortable with cute gestures of love than steamy, sensual, dramatic ones! What can I say, it’s just not me. So anyway, M & I were talking about what to do for Valentine’s Day this year, and since I have no spare cash, after just paying my taxes (ouch), I suggested we just stay in and have a nice meal. 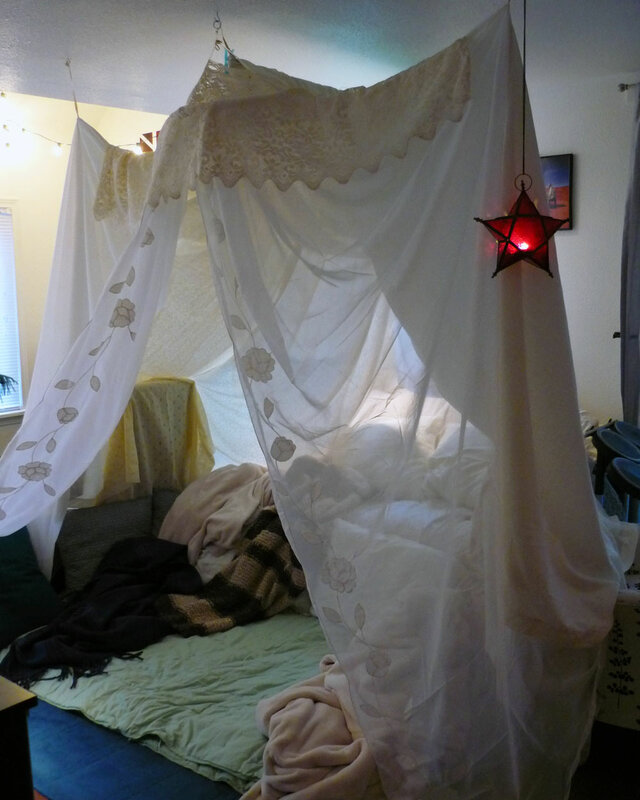 And I mentioned, “oh and we should build a fort!” To which M just chuckled. Little did he know. 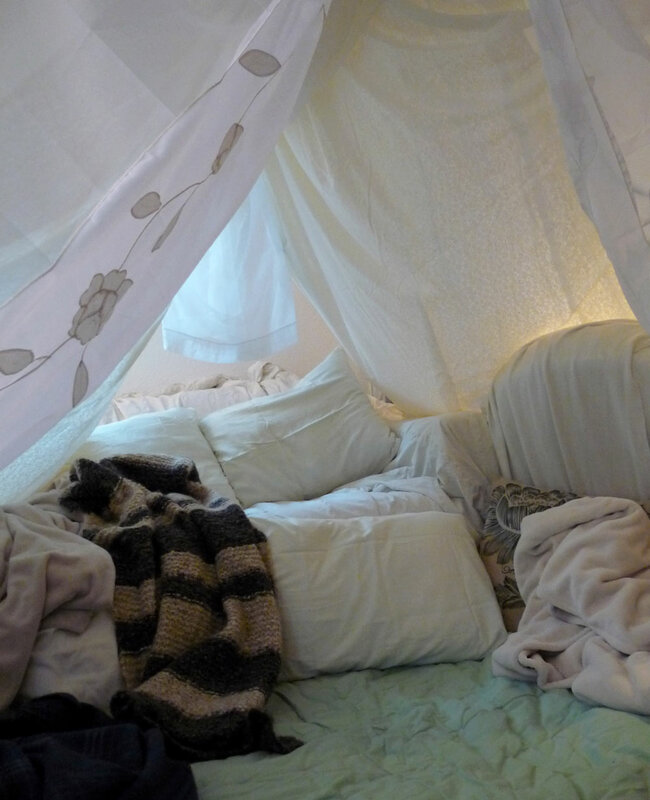 I was going to build a fort. This is my kind of romantic. 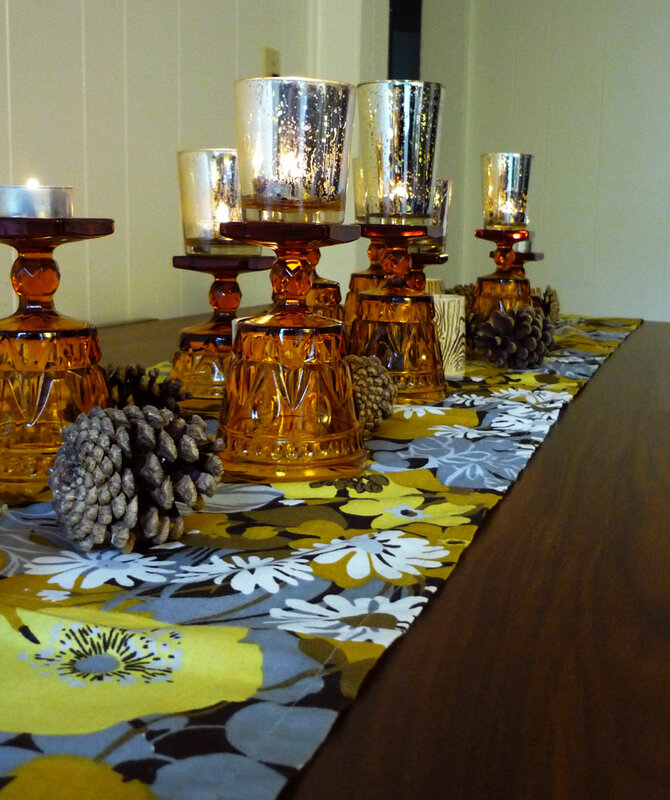 I wish I could say I have all kinds of rich tapestry linens hanging around my house, but I had to make due with what I could scrounge from my closets. I found 3 gauzy curtain panels, a couple of flat sheets, 2 lengths of lace, and just about every throw blanket and pillow in the house. I used the method in the Design*Sponge post – draping the sheets over a broom handle suspended from the ceiling, string and safety pins. 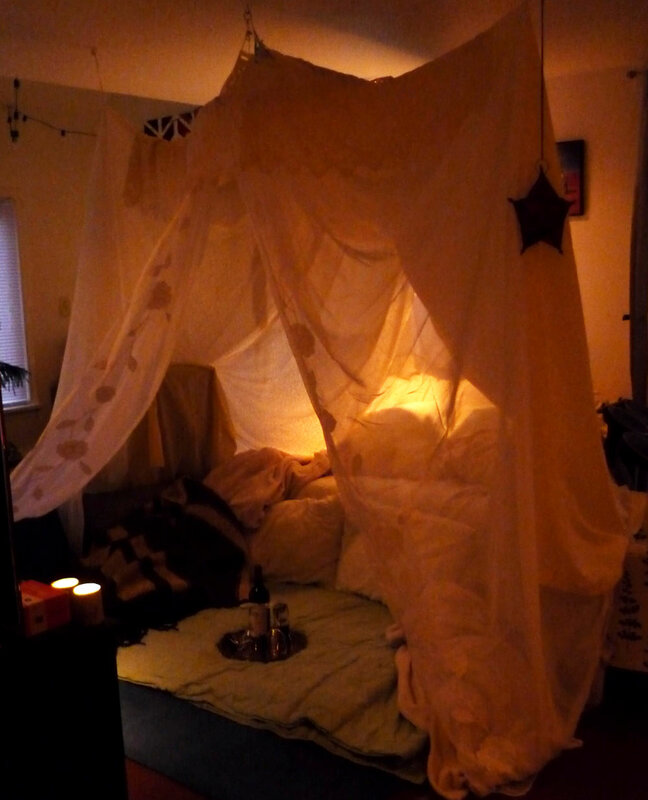 I also used a large embroidery hoop in the front, from which the airy curtains hung. I also made some chocolate truffles (what’s Valentine’s day without chocolate?). The last finishing touch was gussying myself up. On a normal work day, since I work with clay all day and my studio is home-based, I wear jeans, a t-shirt, and my work sweatshirt. Rarely do I put on much make-up if I’m not going to see people. It’s super fun and colorful, and very retro 50s. Then I did my face up all pretty-like. 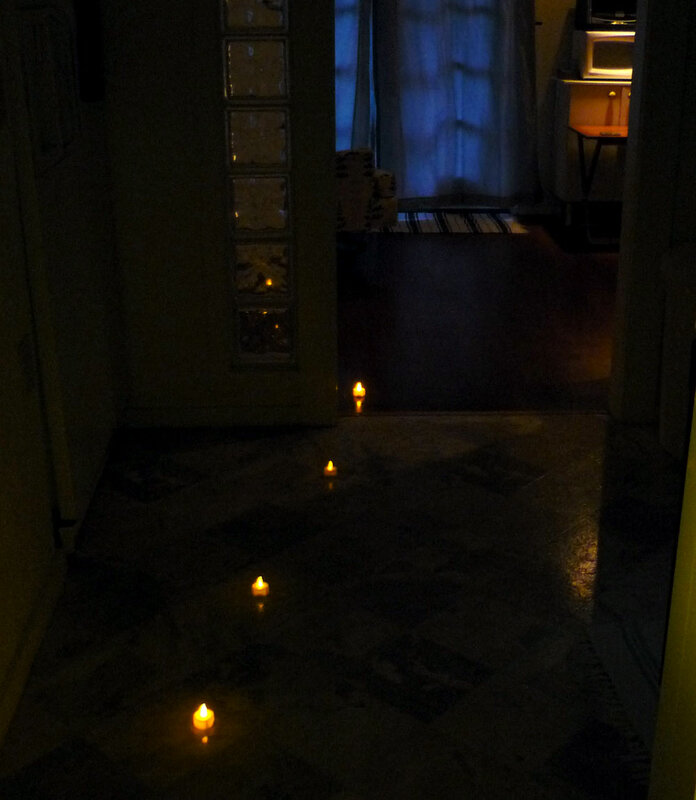 The rest of the evening was spent on the floor, with wine, dinner and a movie. Now that’s my kind of romance. Pigs in Space costume: Happy Halloween! 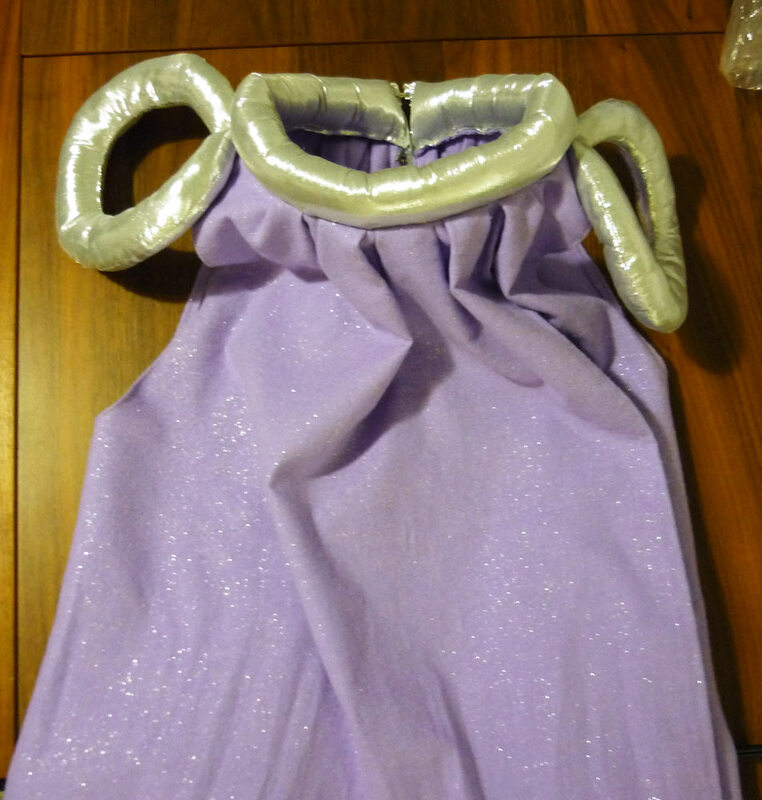 So here is my final post, wrapping up my process of creating a Miss Piggy Halloween costume – the Pigs in Space 1st Mate Piggy costume! 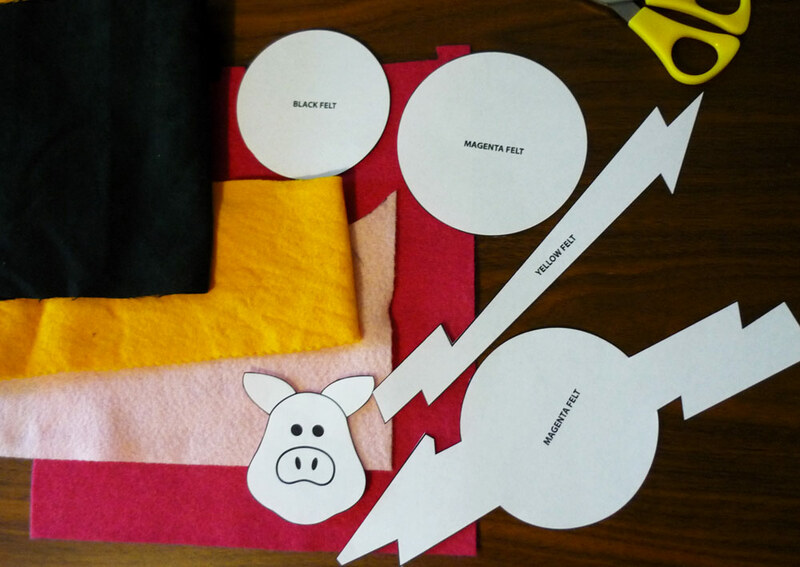 In my previous 3 posts, I went over how to make Miss Piggy Ears, sew a Pigs in Space uniform dress, and make a Pigs in Space felt logo decal. Now we put it all together with accessories! First Mate Piggy – finished costume! Now, you can see, I stitched the felt decal onto the front of the dress. 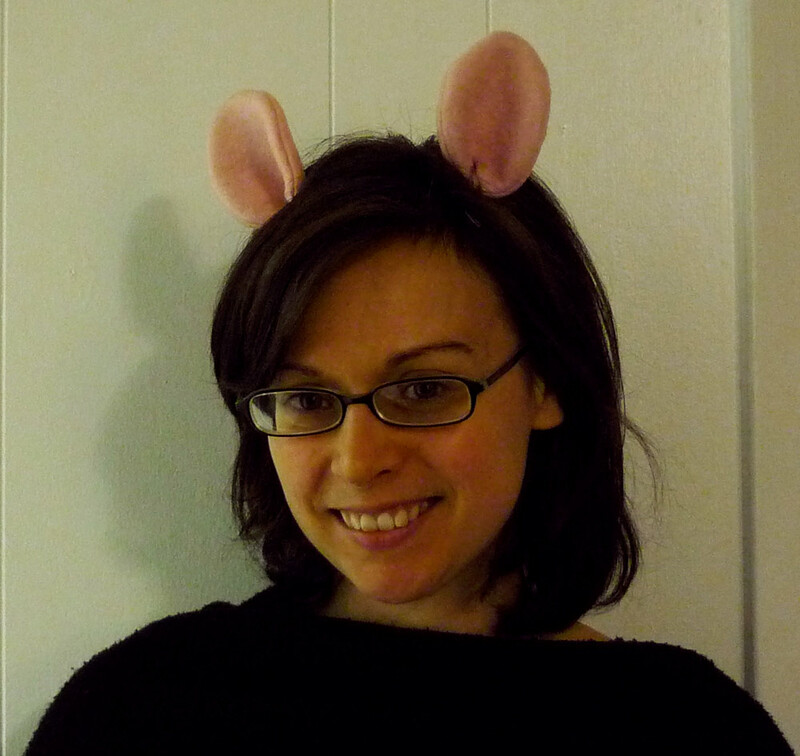 And I also stitched the ears onto the wig itself – which was great, since there was no bulky headband or obtrusive clips. And I can snip the threads later if I want to use the blonde wig for something else in the future! First! A blonde wig. Very important to have the right hair. The wig I found was a tad bit too blonde, if you know what I mean. Classic Piggy hair is really more of a dirty blonde. You know, ‘cuz she was natural back in the day. (It’s so obvious that Piggy bleaches her hair these days, haha). Next, the eyes! Piggy’s signature look is thick luscious eyelashes and a pink/purple eyeshadow. Also, her eyes are slightly downturned. 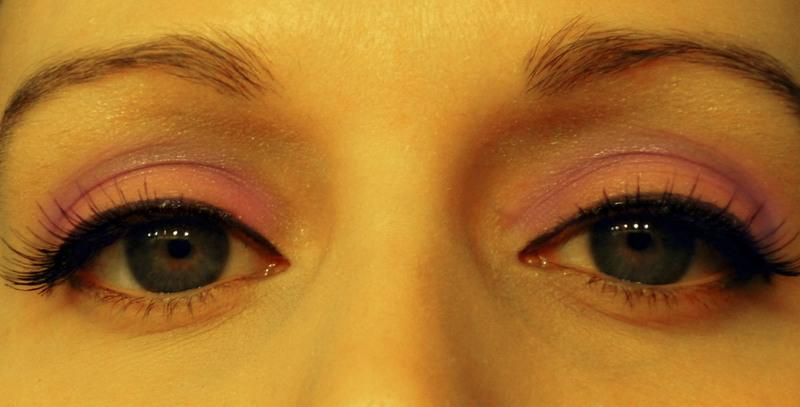 I achieved this look with a thick line of eyeliner, false eyelashes, and a layered application of pink and purple shadows on the lid. Next comes all the silver! 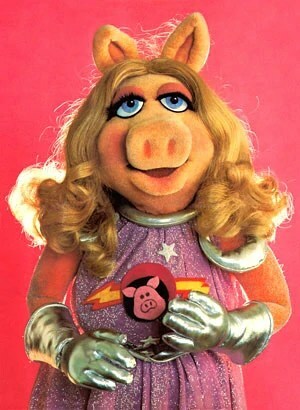 Miss Piggy always wears gloves, and in her Pigs In Space costume, she trades her signature purple gloves for silver ones. I found mine on Amazon. Then you’ll need a silver belt. 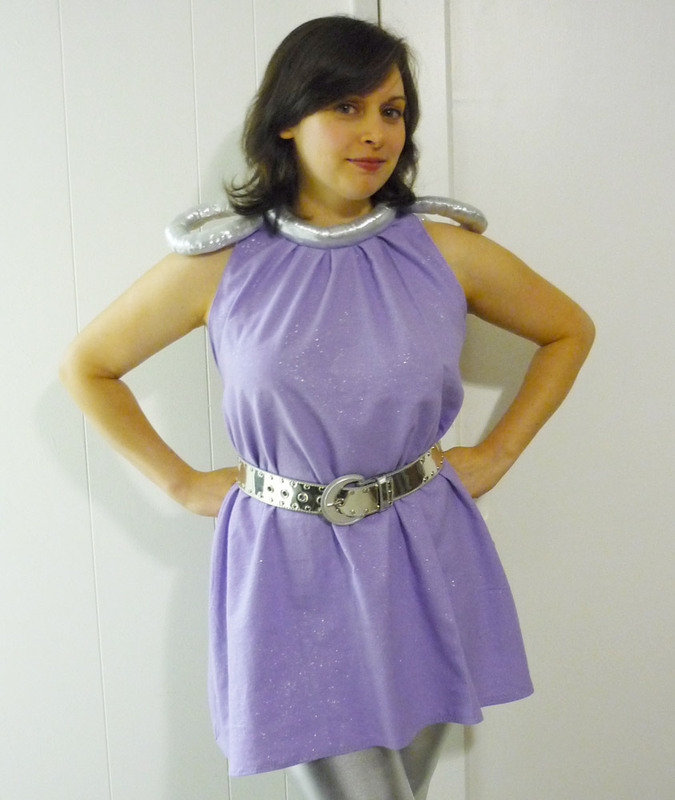 Of course, you can make one, but I lucked out and found a shiny metallic belt at my local Goodwill for $4. Score! 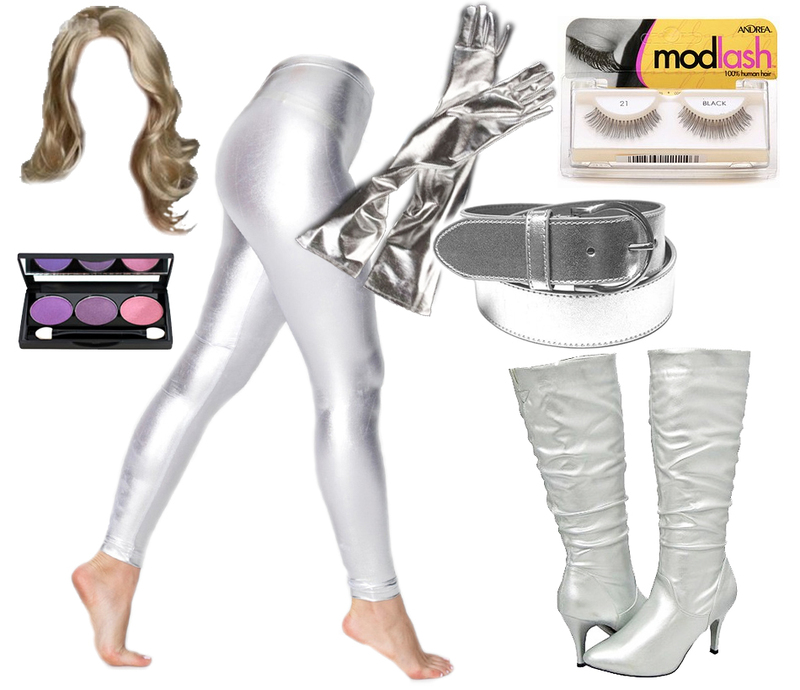 You can see she has silver leggings and silver knee-high boots. 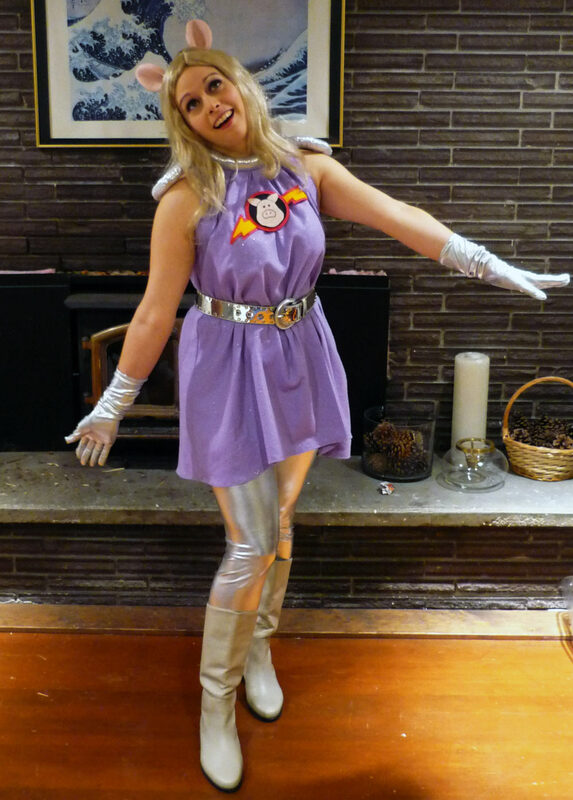 As luck would have it, I already owned some shiny silver leggings (from two Halloweens ago – when I dressed as a Cyberman..er..woman). They are from American Apparel, and pricy, but I’m glad to get multiple uses out of them! Then the boots…well, I didn’t want to splurge on silver boots when I’d probably never wear them again. 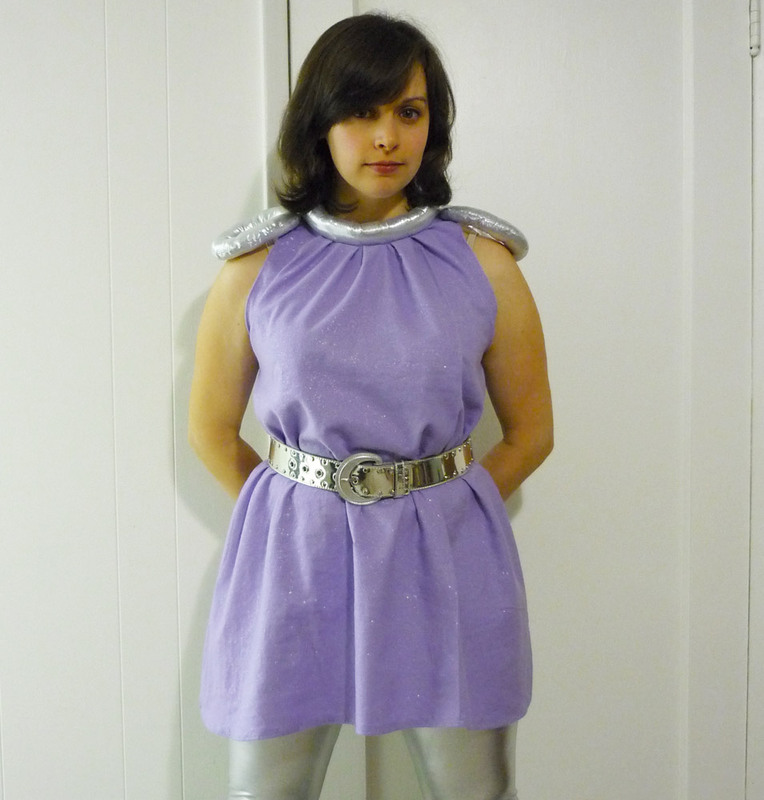 So instead, I used my off-white boots, which were from my Princess Leia costume from 5 years ago. Lol…yes, I generally choose very nerdy subjects as Halloween costumes. I’m cool with that. First Mate Piggy costume – Happy Halloween! So there you go! Happy Halloween to all you folks. Hope it’s a fun one! Kissy kissy! 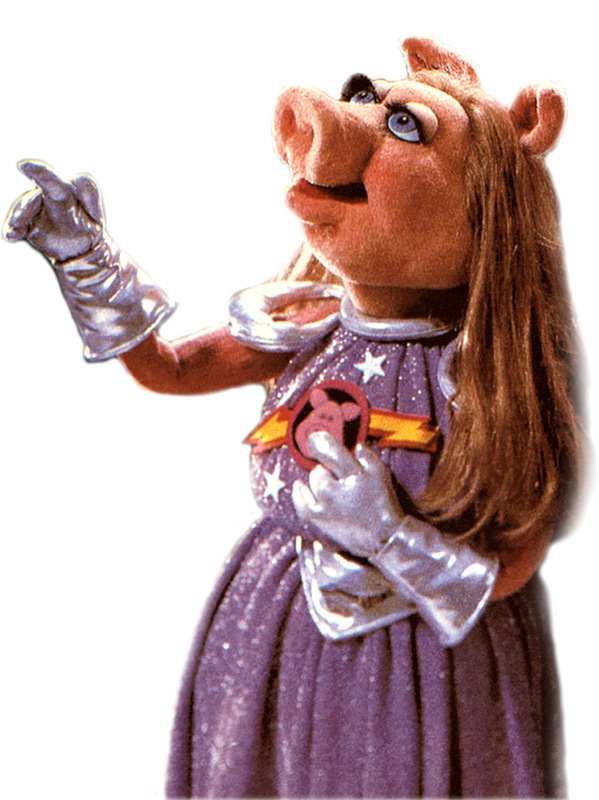 Miss Piggy’s Pigs in Space costume wouldn’t be complete without the oh-so-retro uniform decal on the front. 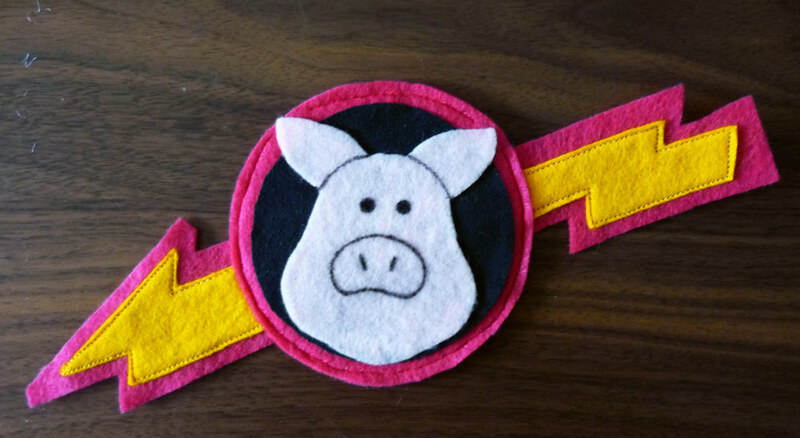 Now, for my Pigs in Space costume, I wanted to make the decal out of felt – these are Muppets, after all. So to make things a little easier, I created a PDF of the individual components of the decal, so they could be traced onto felt for easy cutting. Print out the template above and cut out the components. 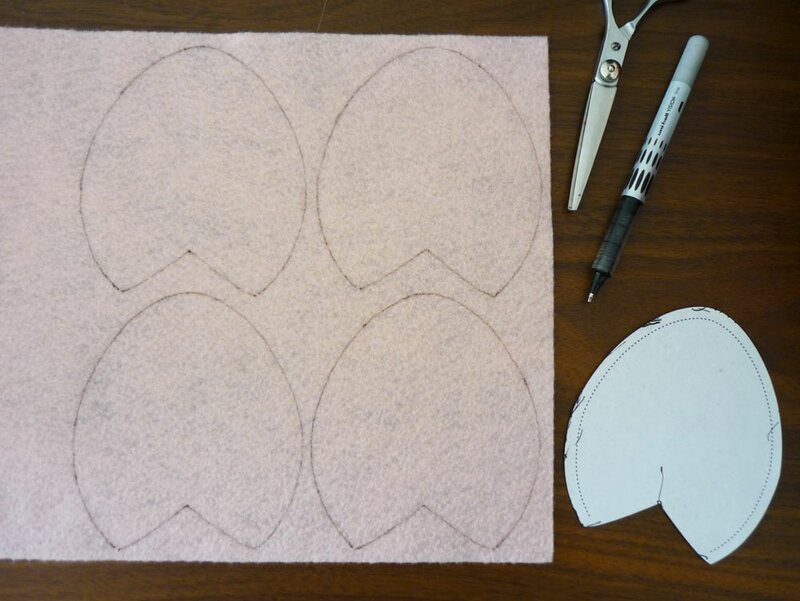 Trace each component onto its respective felt, and cut each piece out. 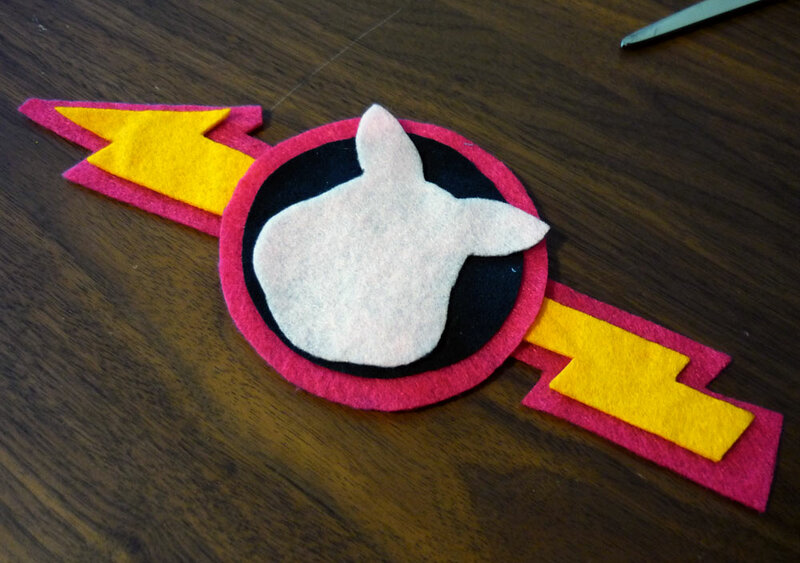 Next, glue each piece in place – I just used Elmers Glue – and then place under a heavy, flat object (like a book) until the glue sets and the felt is securely laminated. Be sure to protect your table and book by using scrap paper if you think the glue might bleed through the felt! 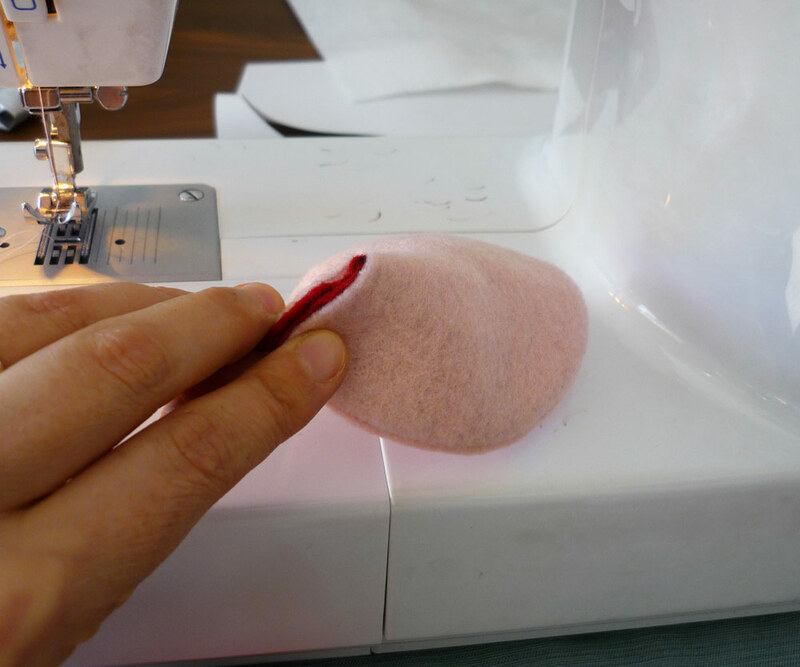 If you’re an overachiever, you may feel the need to do a little stitching, just to be sure the felt is good and secure. And there you have it! Attach the decal to your First Mate Piggy uniform dress and it’s ready to go! Oh, and I realize there should be 6 white stars surrounding the decal…we’ll see if I get around to cutting out some stars to add to this costume. It’s the small things that seem to be the most difficult to finish! OK! So perhaps you have your Miss Piggy Ears, and now it’s time to get moving on the actual dress of your First Mate Piggy costume. 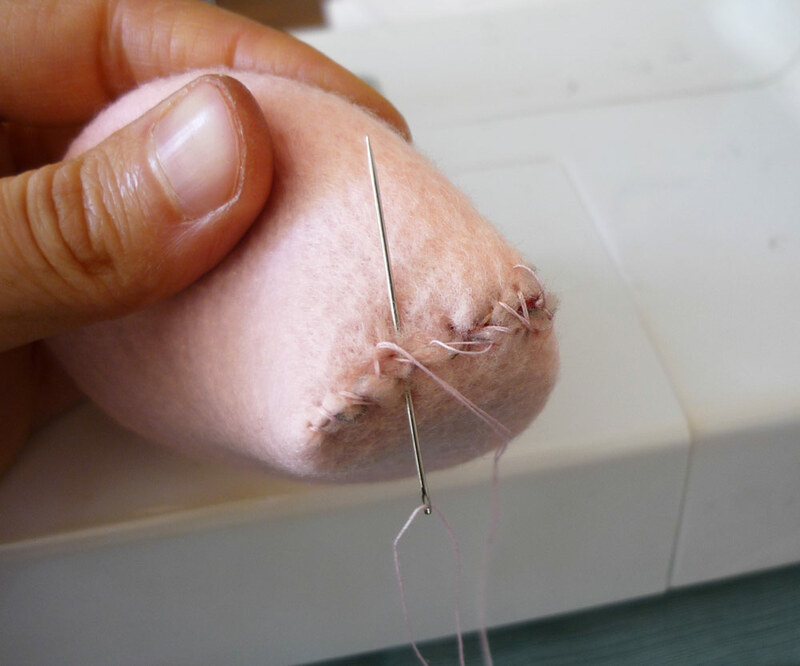 Disclaimer: I am not an experienced seamstress! Most of my methods are just from figuring things out as I go, so take these instructions with a grain of salt. If you have pointers, tips or other suggestions for folks who may try to attempt a similar costume as the one I’m making, feel free to share in the comments! First Mate Piggy costume tutorial – before adding accessories! First, using the PDF guide I made above, cut out the dress shape. The front and the back are identical, so you’ll need two. Please ignore the fact that I didn’t iron my fabric (for shame!). Next comes hemming the bottom edge. 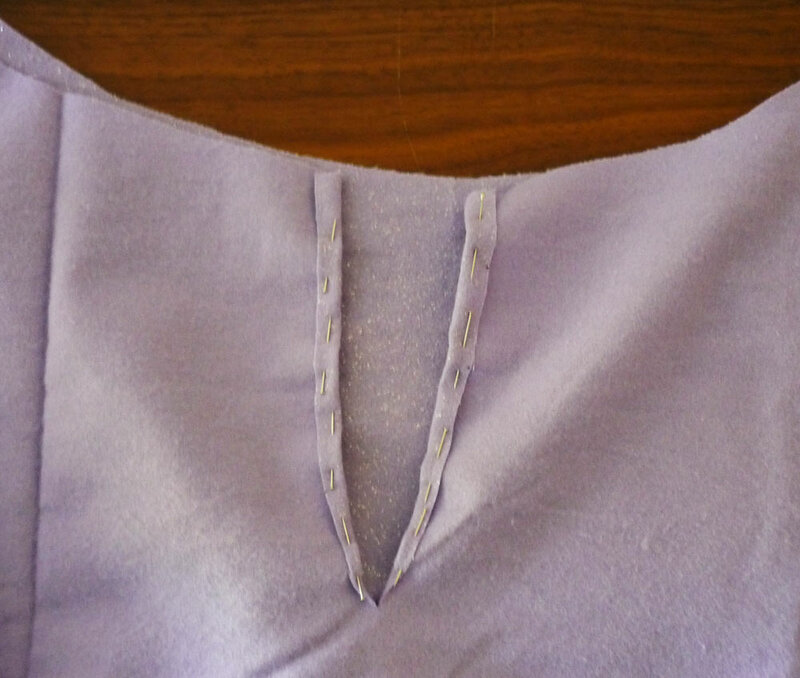 I did a 1/2″ (or so) hem, and used a zigzag stitch so it would lay nice and flat. 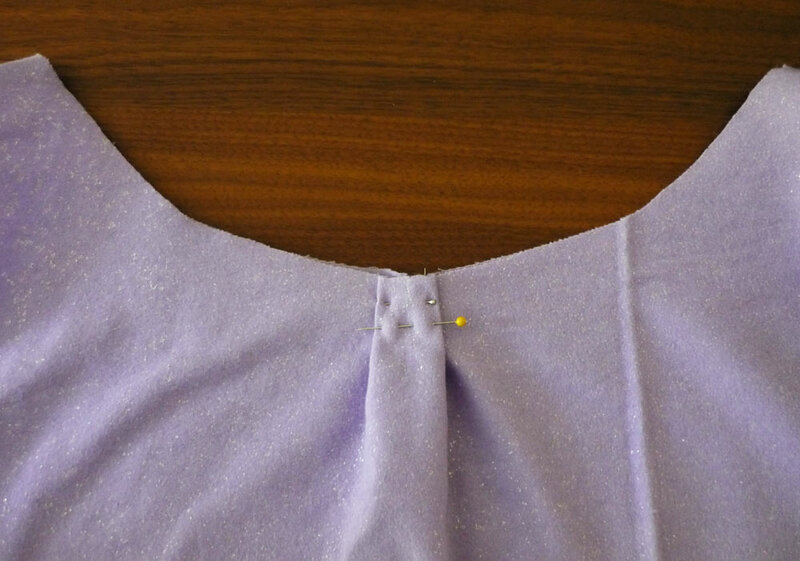 You’ll also want to hem the armholes in this way, too, for a nice finished edge. I used a 1/4″ hem for the arms (sorry there’s no photo!). Soon, we’ll be gathering in the neckline, so the next step is making a slit down the back, so you can fit your head in when it’s done! 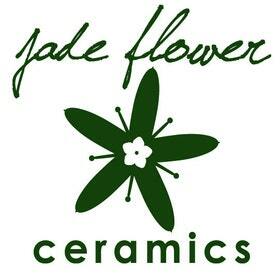 Find the center of the back, and make a 6″ cut straight down. 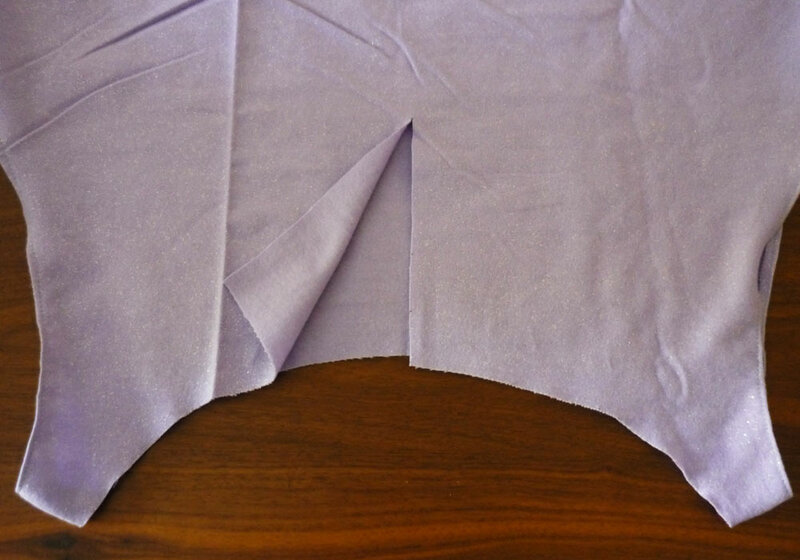 Pin the edges back about 1/4″ inch and hem it. 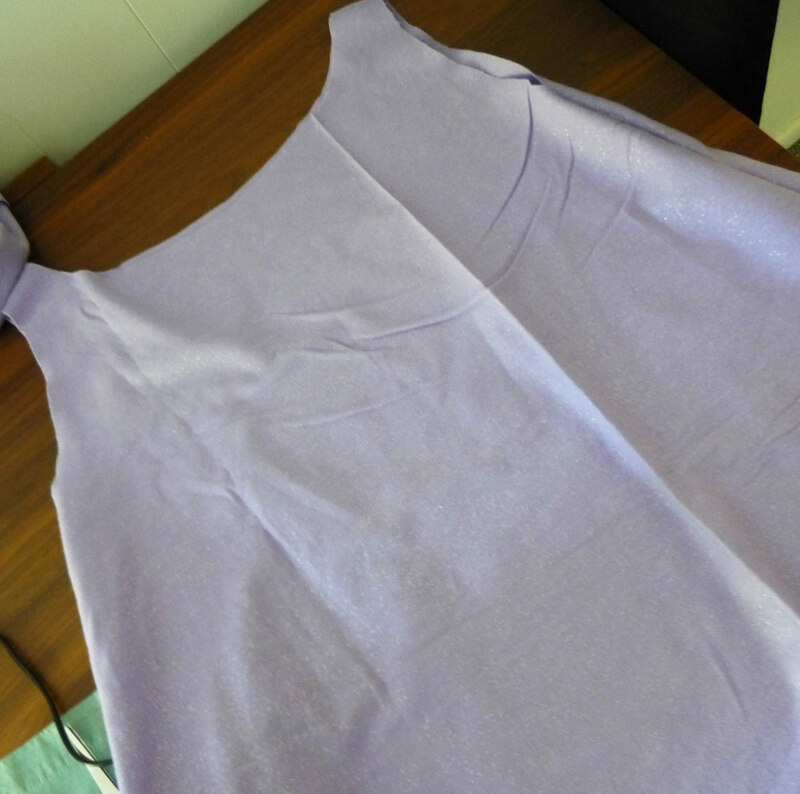 Once that’s hemmed, we’ll begin pleating the neckline. 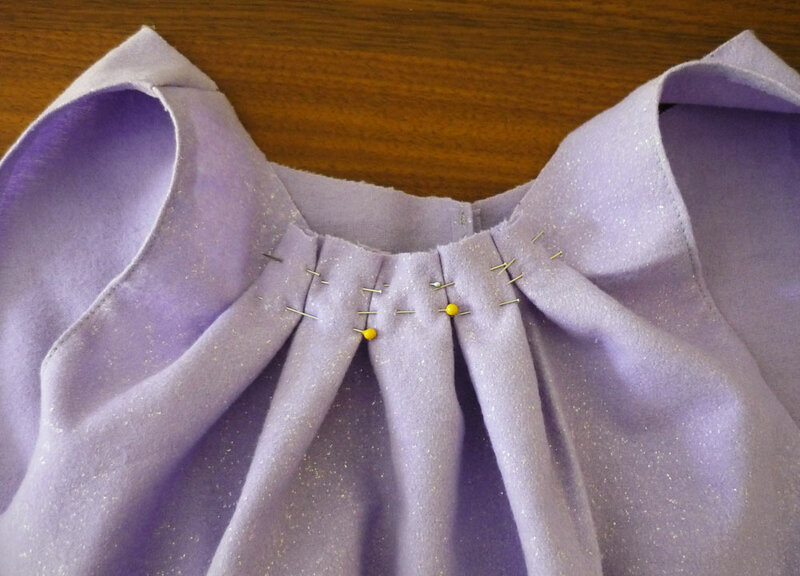 Continue folding pleats on either side of your first one, pinning as you go. Make sure they are symmetrical. I got 5 total pleats. I used lots of pins, just to make sure it didn’t come apart when I took it to the sewing machine! I was surprised at how well this worked! 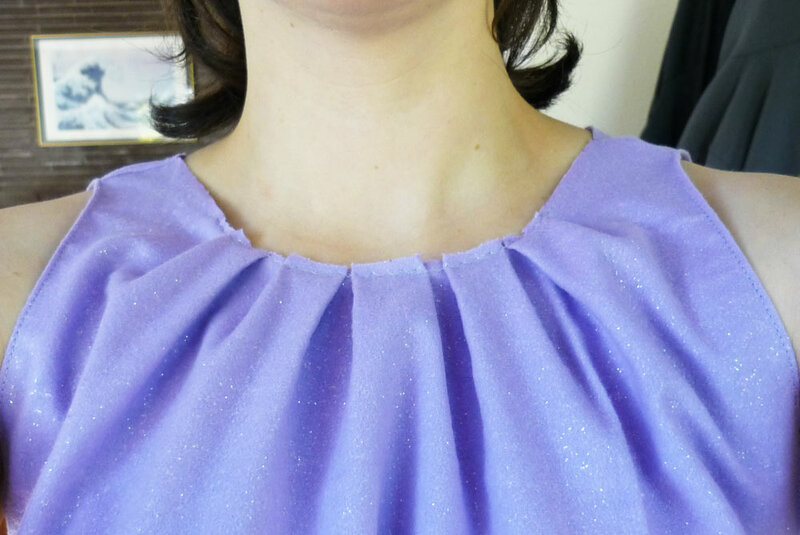 (haha) It really brought the neckline in, and the dress is starting to look like a real piece of clothing. 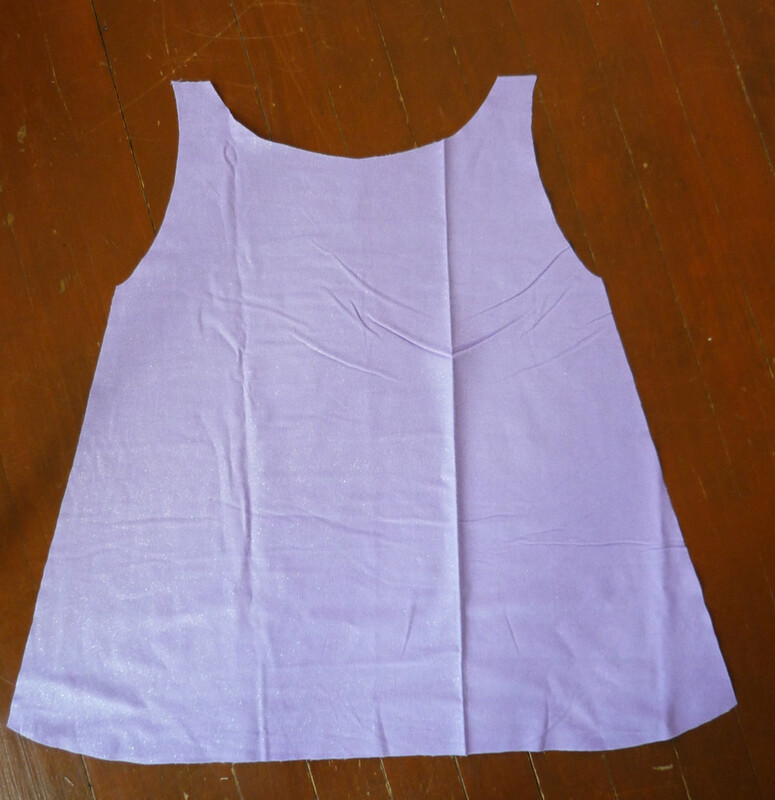 And now, because the dress is still all floppy and open in the back, we need to pleat the back, too! 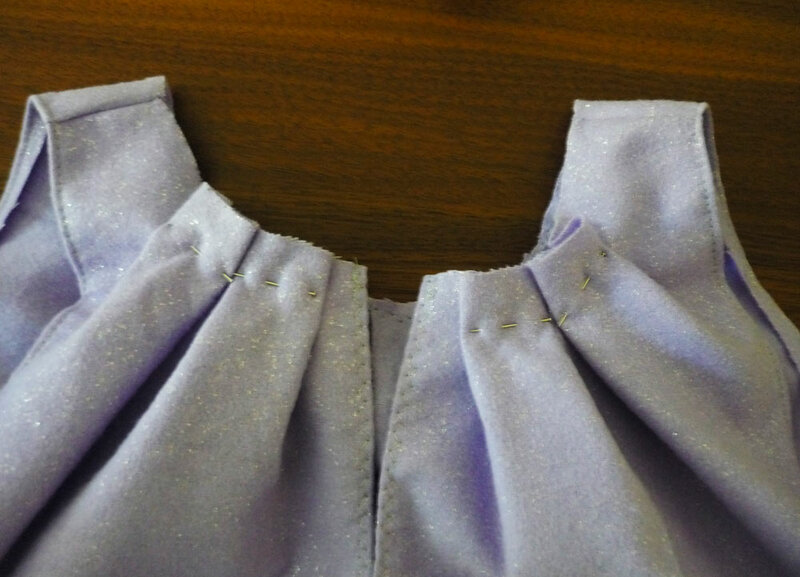 Using the same folding and pinning method, add pleats to the back of the dress. I got two 1″ pleats on each side of the slit. Pin it up and then take it to the sewing machine! 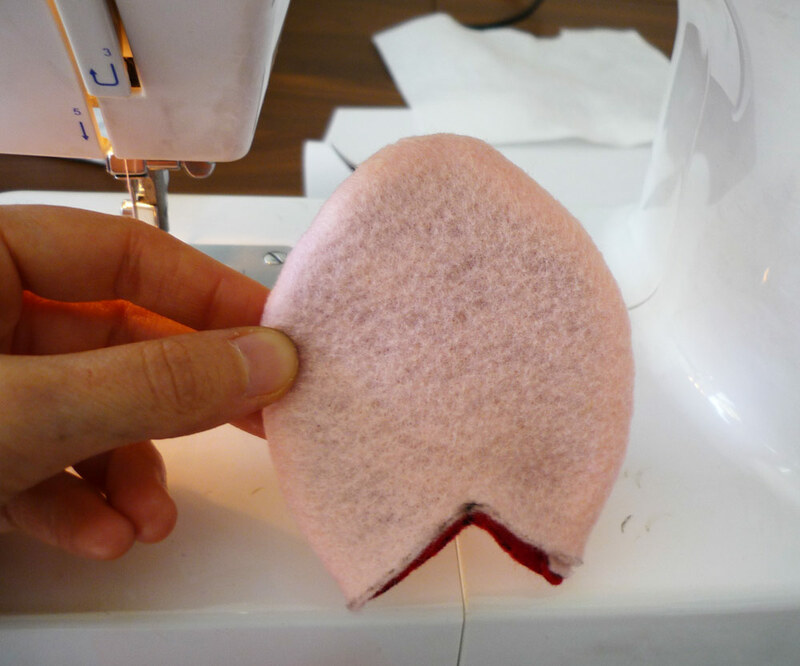 At this point, you can sew a set of eyes and hooks to the top of the head opening, so that you can clasp it closed. 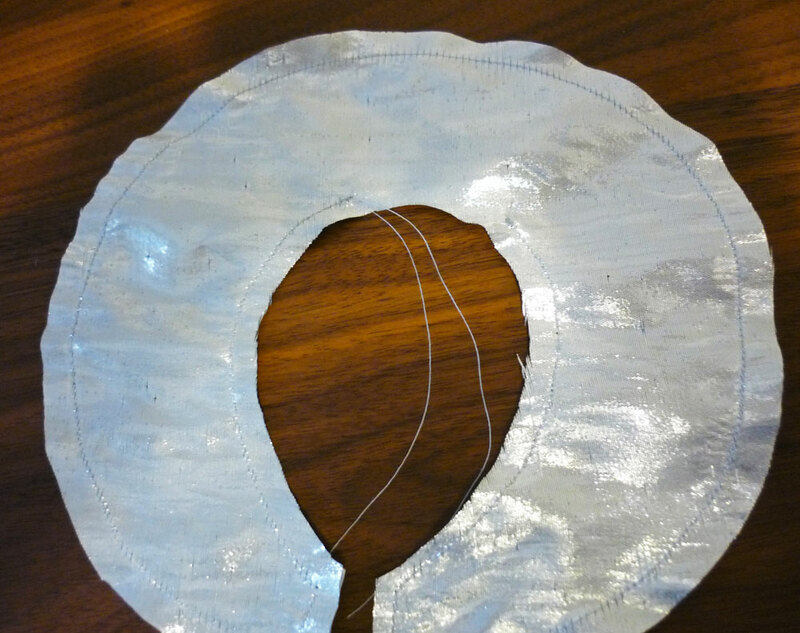 Next it starts getting trickier, because we’re adding the silver trim to the dress. And I didn’t take as many pictures of this part as I should have. Forgive me! We’re moving on to the puffy silver collar on Piggy’s dress. Now we need to stuff that collar! 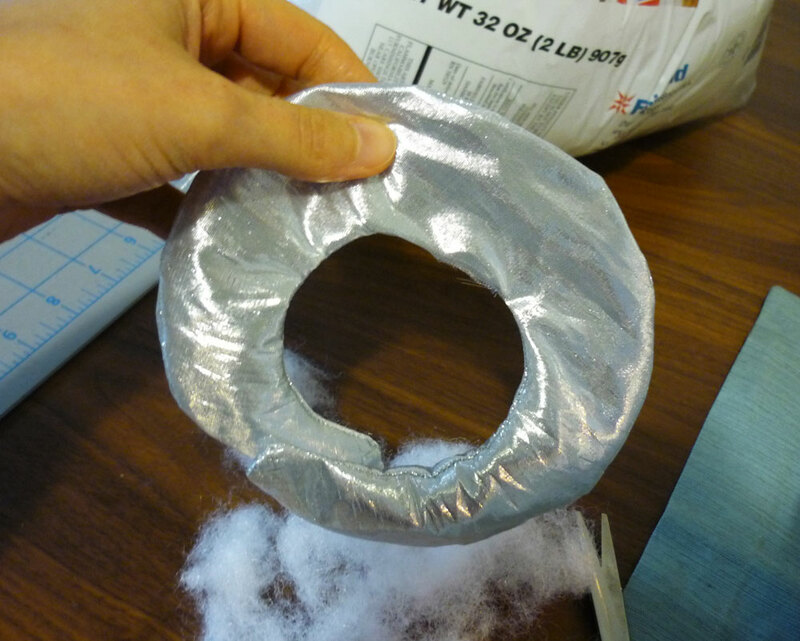 Grab your polyfil and pack it in good and tight through the openings at either end. 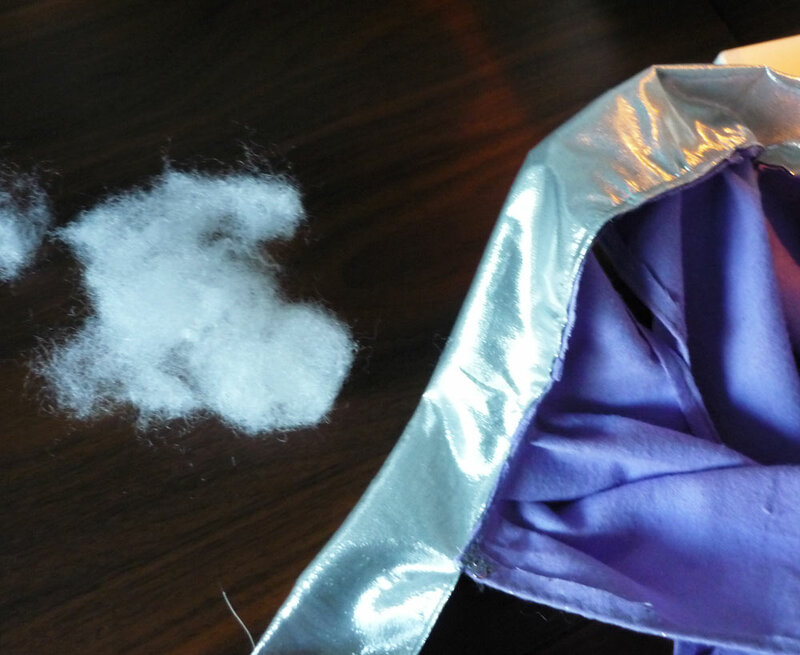 Once the collar is filled to a uniform density, trim off the excess silver fabric, but leave enough to fold over twice – you’ll sew each end closed this way. 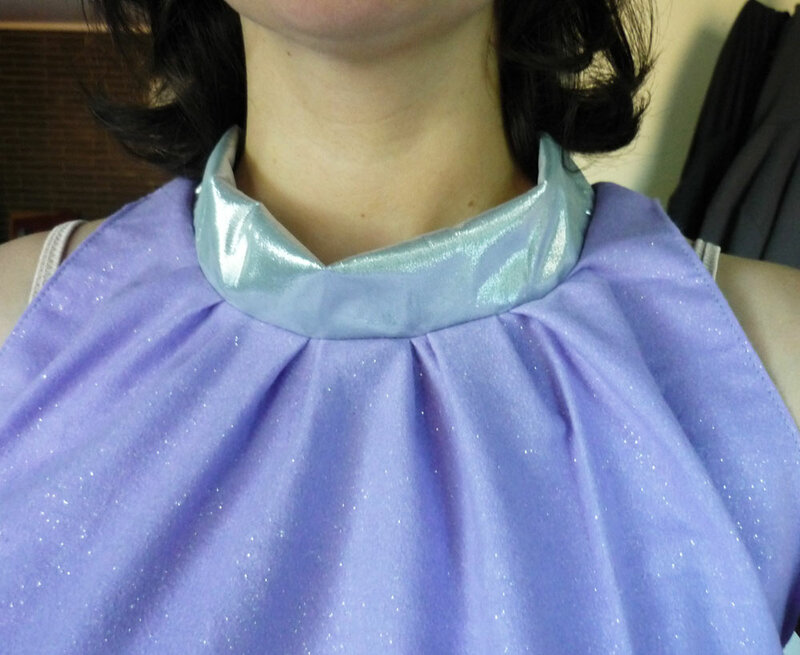 Add another eye & hook to the top of the collar for closure. We’re almost done! Next up we have the silver shoulder loops, or epaulettes if you will, which complete the look. I made a simple template with paper – it’s a 7″ diameter circle with a teardrop shape cut out of the middle. 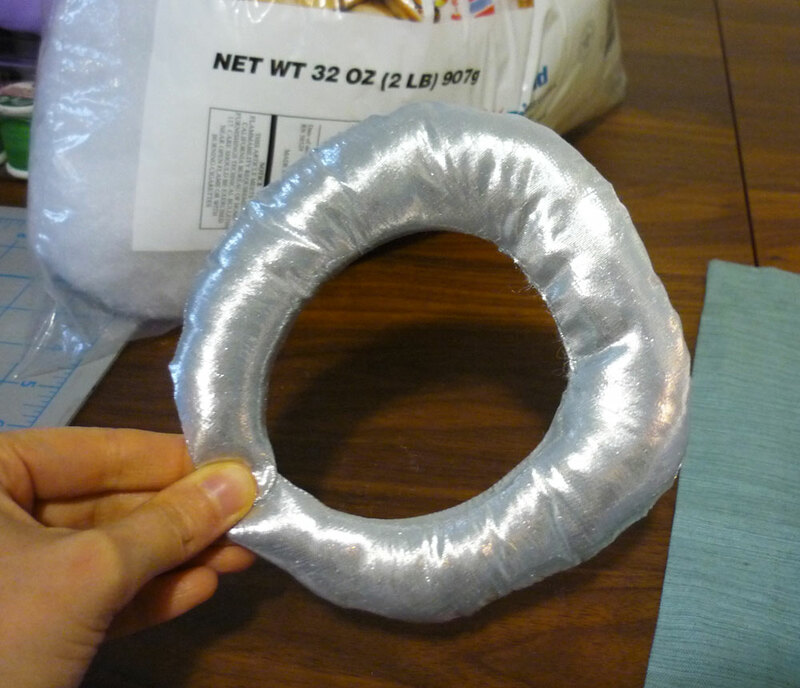 The width of the loop is about 2.5″ and tapering at the ends. 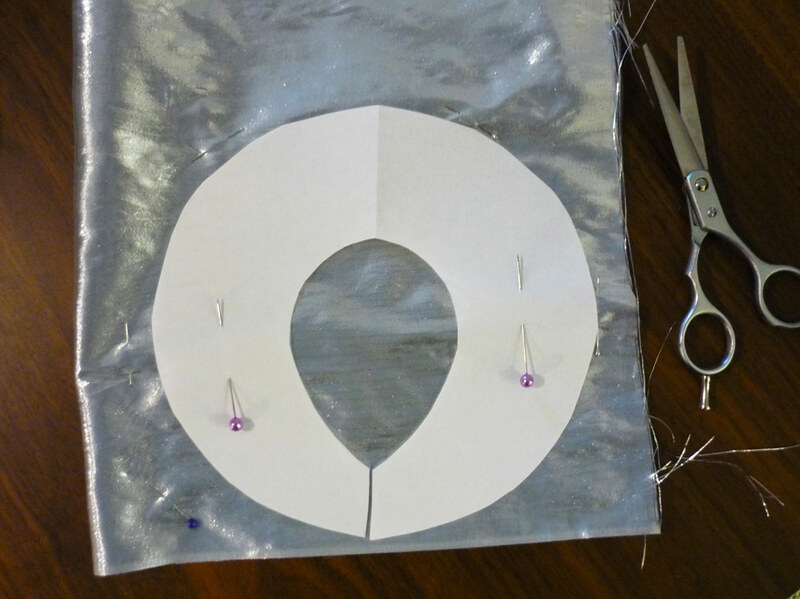 Cut out 4 of these in your silver fabric. 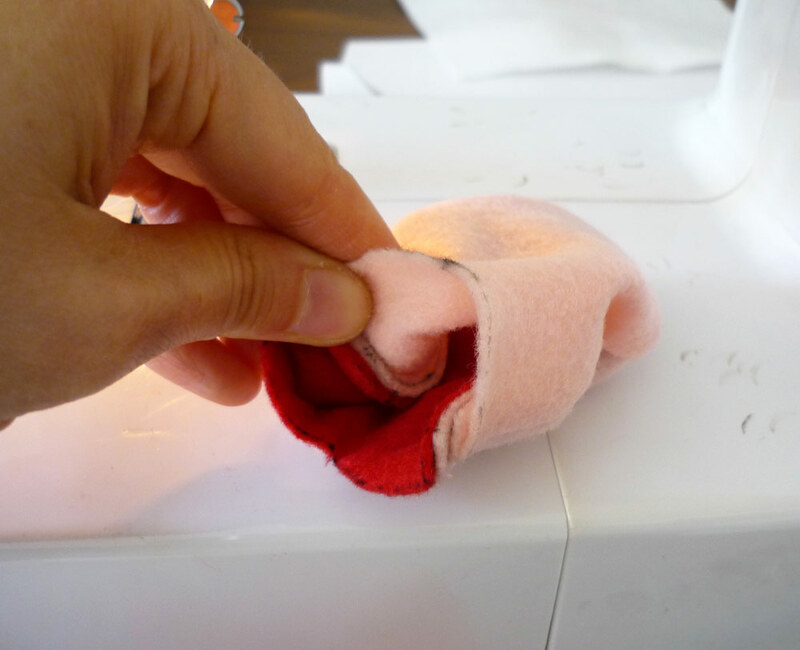 Stitch 1/4″ all the way around, except leaving a 2″ gap somewhere so you can turn the shape inside-out. 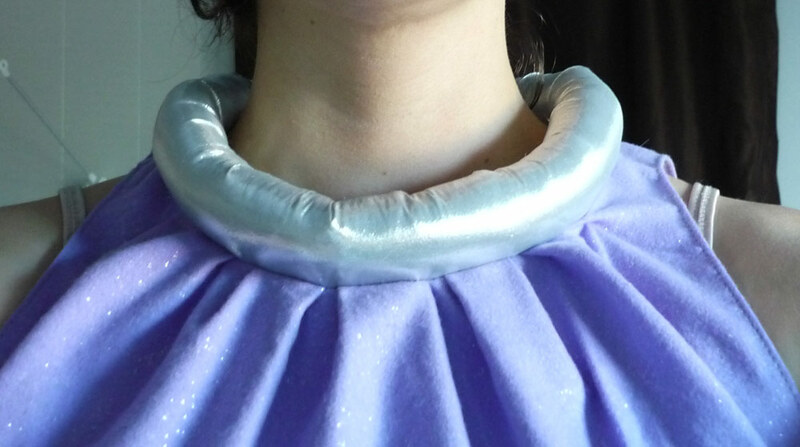 Add your polyfil, just like you did for the collar. When it is filled, stitch closed the opening (I used a needle and thread, not the machine, for this). 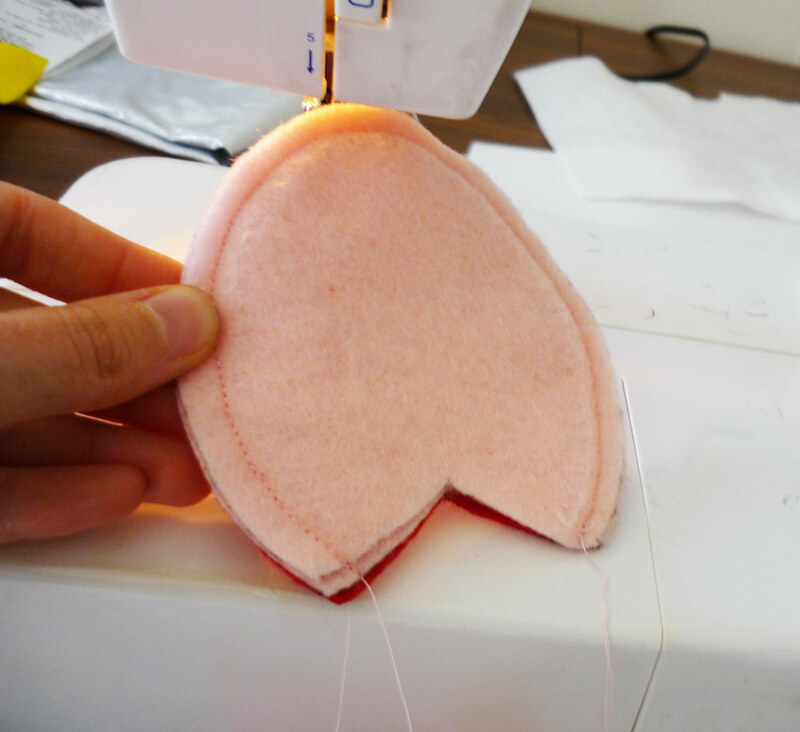 Once you have two of them stuffed and sewn closed, they’re ready to sew onto the dress. 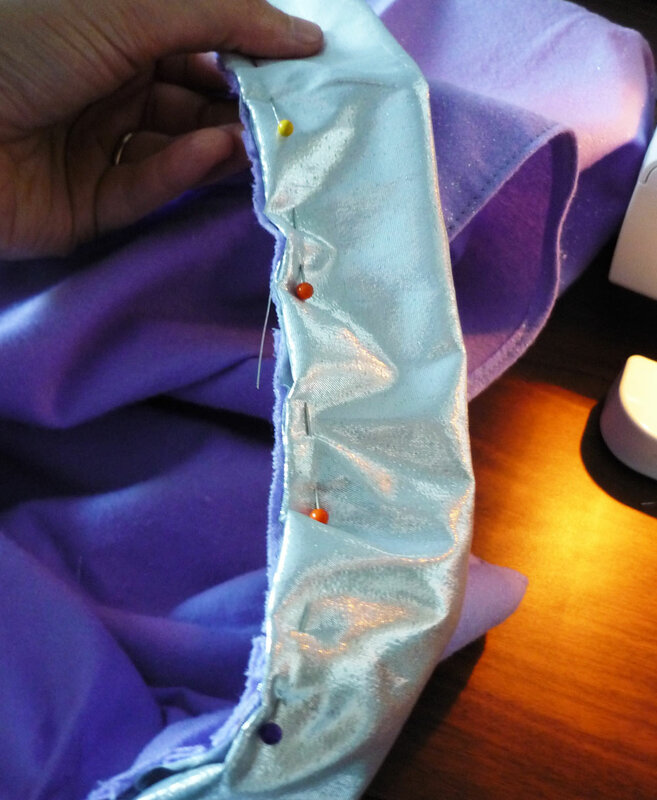 Using a needle and thread, attach each epaulette to the top of the shoulder, as close to the collar as you can. Add a belt to complete the shape. October is here, and that means pumpkin flavored everything, changing leaves, and of course, gearing up for Halloween! I love Halloween, and the craftiness that goes along with it. Ever since I was a wee one, my mother always made our costumes – I don’t think I once got a store-bought one. At times I thought this was so unfair – seeing those shiny racks of pre-made costumes at the store. But now it is quite obvious to me how lucky I was to have a mother with creativity and the desire to make something from scratch for her children. To this day, if I wear a costume, you can be sure I made or assembled it myself. This year is no exception! I got it in my head earlier this year that I wanted to do something Muppet related. Then I narrowed it down to Miss Piggy. But Piggy is such a fashion diva! I couldn’t decided on an appropriate outfit. Then – inspiration! Pigs in Space! 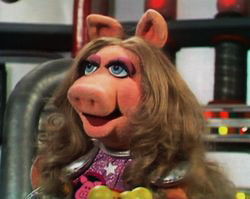 First Mate Piggy has the most rockin’ space getup. 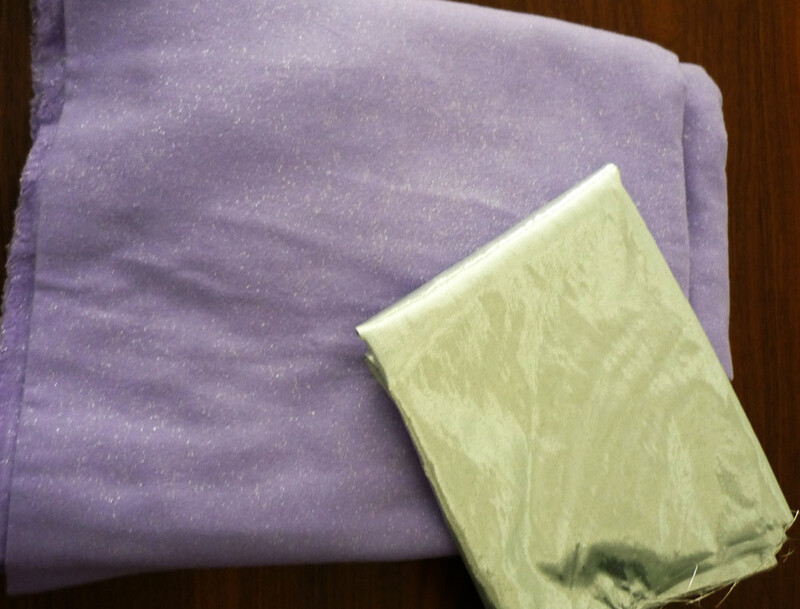 Light purple with silver accessories. Iconic and classic. I’ll have a full tutorial on how to make a Pigs in Space outfit soon. But first! 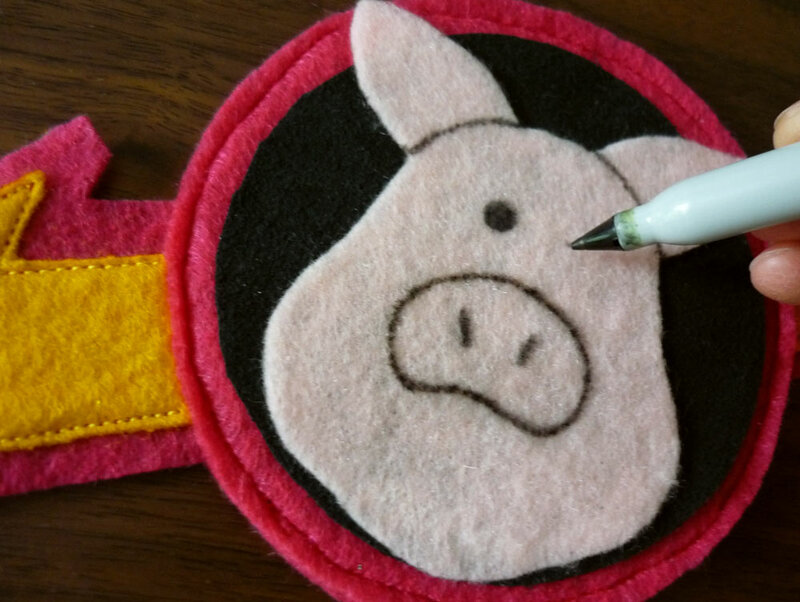 No Muppet pig is complete without ears, so here’s how to make a simple pair! Print and cut out your ear template. 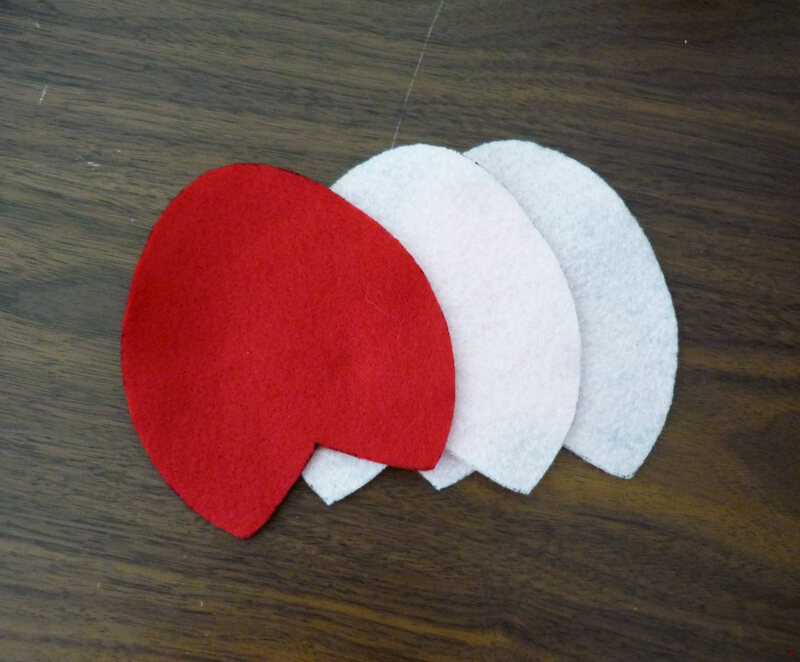 Trace 6 ears onto your felt. I used three layers to make the ears more solid and sturdy. Line up your three pieces and secure with a few straight pins. 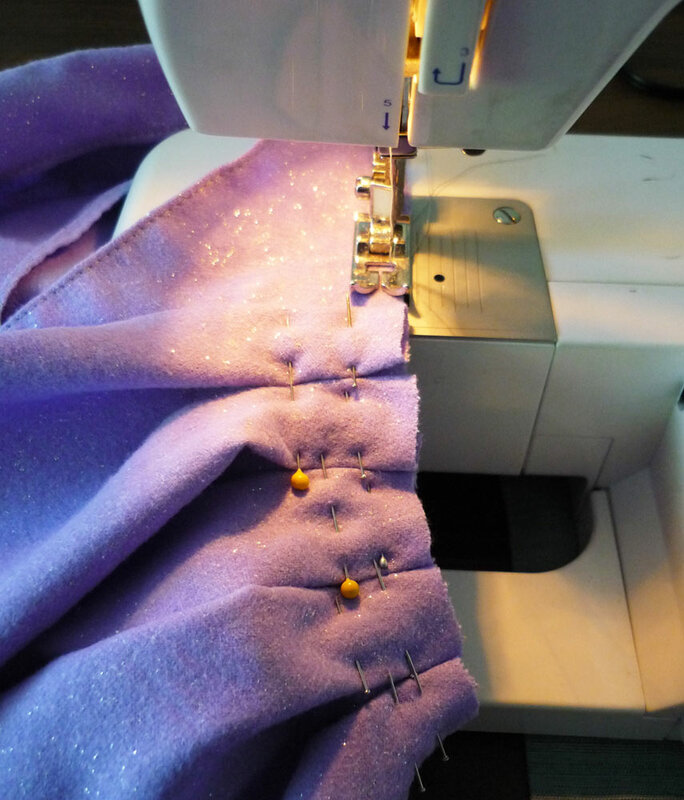 Stitch a seam, using the Template as a guide (be sure to leave an opening for turning it inside-out). 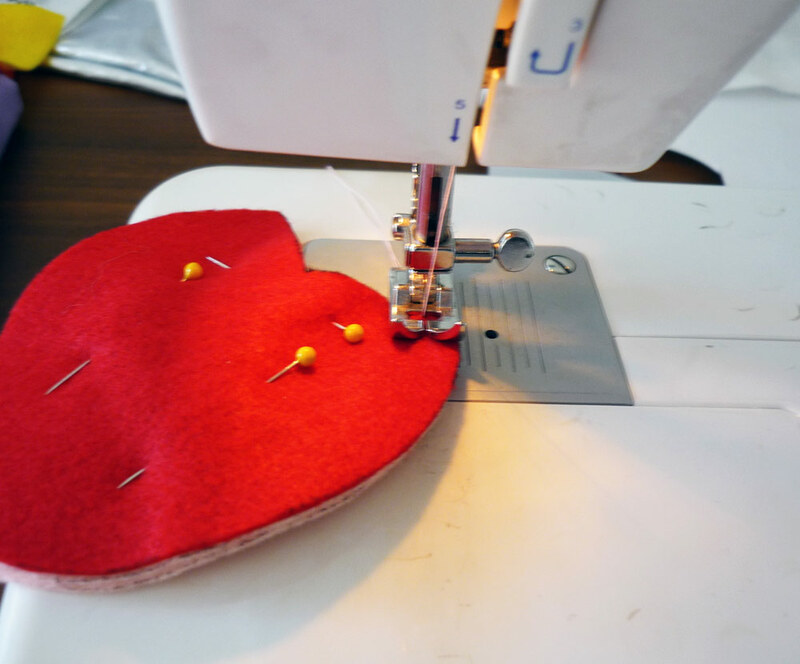 A sewing machine makes this super quick, but it can be done by hand too. 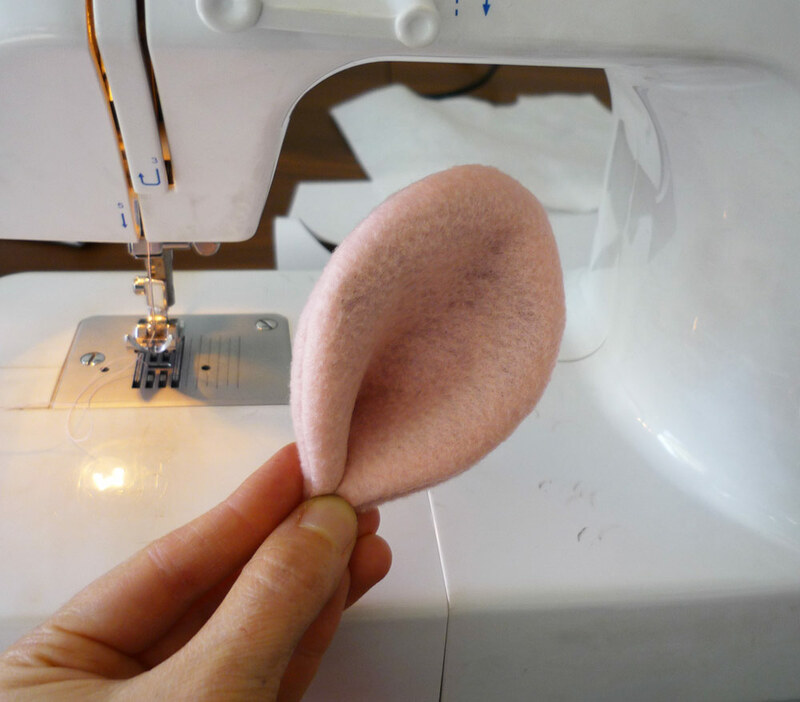 Carefully turn the ear inside-out, so the seam is on the inside. 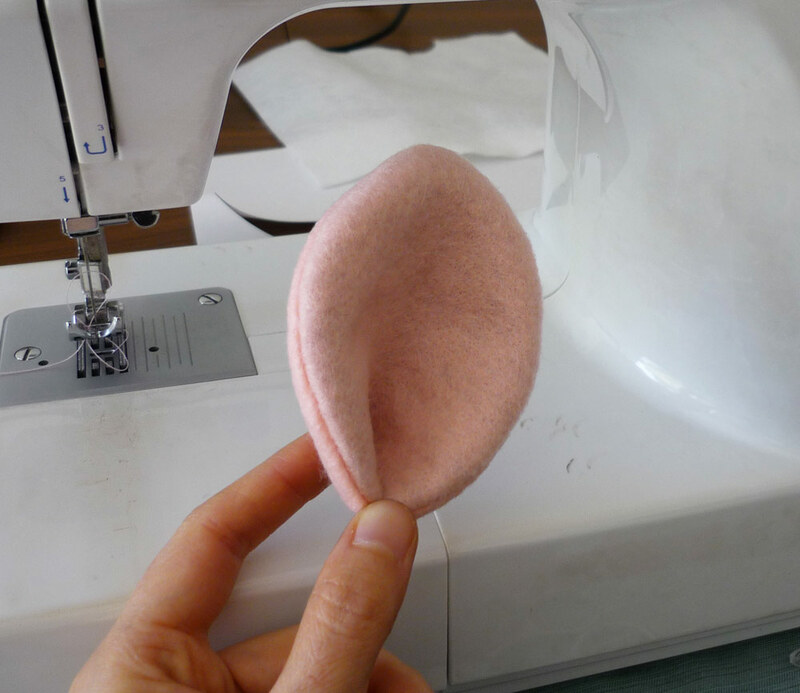 Using your fingers, smooth out the inside seam and shape the edge into a nice ear-shape. Pinch the open edges together so the ear cups in to form a concave shape. 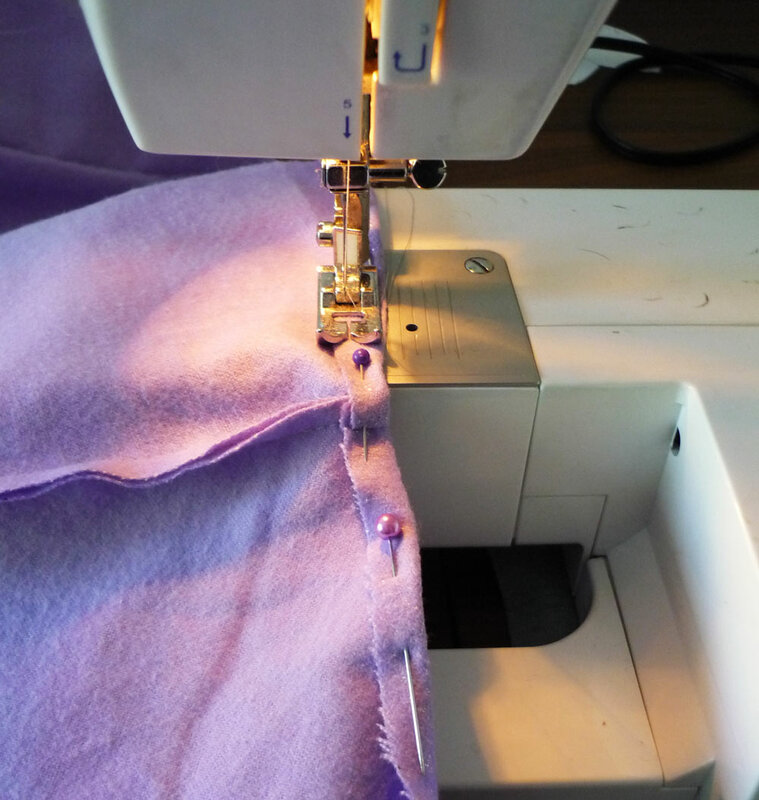 You can use your machine again to close this seam, or you can do what I did and hand-stitch it closed. Be sure to get through all layers of felt. Then you’ll make a second ear the same way, because they work well in pairs. 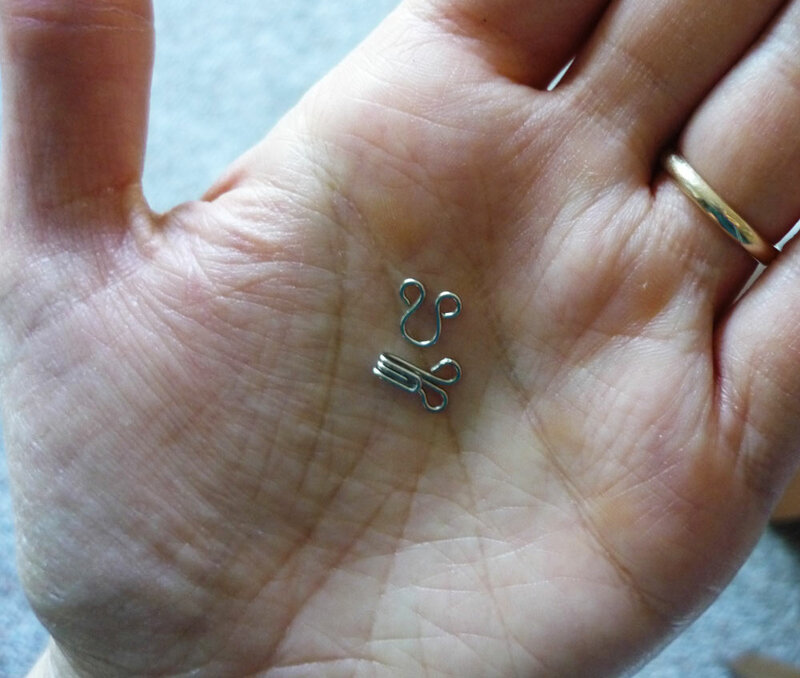 From here, you can attach them to a headband, or hair clips, or stitch them directly onto a blonde wig! 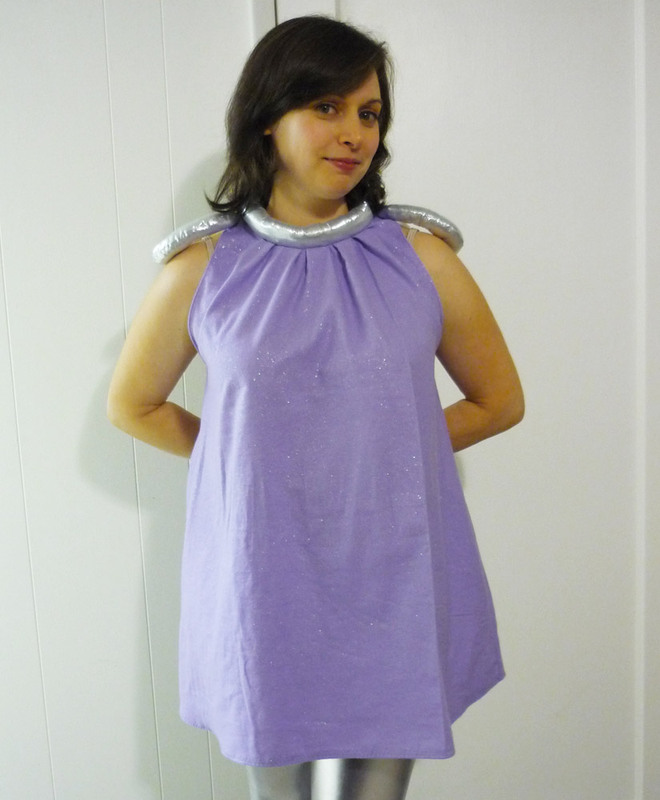 Stay tuned for my First Mate Piggy space dress Tutorial later in the month!